You’ve probably heard that wood doors require a little more maintenance than fiberglass or metal doors. We’ve even mentioned it in several articles, including How To Choose a New Front Door. So why do people buy wood doors when there are lower maintenance options? Well, their beauty just can’t be matched. Some people will tell you there’s nothing like the satisfying feel of a heavy wood door. There’s also just something about the history of a wood door, knowing it was made from a unique tree that it spent decades growing in the forest. There is one other reason, and it’s that a properly maintained wood door will last longer than your house. 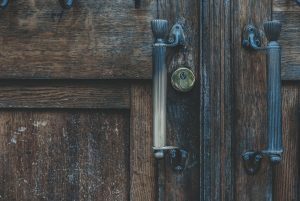 For proof, you need to look no further than many homes in Canada, especially those settled early in Ontario and Quebec, that feature wood doors that are more than a century old. If you think that’s impressive, most old cathedrals here and in Europe feature long-lasting wood doors, including a wooden door at Westminster Abby that’s over 1000 years old! Unlike other doors, wood doors can improve with age if they’re well taken care of. The first tip isn’t even a tip, it’s just something you need to do, and that’s just knowing that each year you’ll need to perform an inspection and give the doors some attention to keep it looking good and healthy. There are many front door repairs you can easily do yourself. You’ll want to fully inspect the door to make sure there’s no moisture penetration. Moisture will destroy a wood door quicker than any other natural element, so you need to be vigilant. Inspecting a door doesn’t just mean looking at the front and back, but all sides of the door including the top and bottom – two places where any moisture damage is likely to be found first. Other damage can be from the wind and dust, or the sun’s uv rays. Although these can be less fatal than moisture, you’ll still want to prevent them where possible. If you do find any damage to your door, you’ll want to get it taken care of asap. If caught early, most damage can be repaired, and the door can be restored. This will be much cheaper than replacing a wood door. If you wait too long, there is a point where a wood door is too rotten and is effectively no longer a door. You’re best bet is always going to be prevention. At the very least, a wood door should be oiled once a year. Depending on your climate, which way the door faces, and how much sun hits the door, you may need more than one application a year. Check with your manufacturer to see what products are recommended for your door. If you oil your door and notice that one part is duller than the rest, that’s a sign the door is taking a little more wear and tear in that area, and you may need multiple coats. This is more common at the bottom of the door. If you paint your door, you may not have to paint it every year, but if not, you’ll want to make sure your inspecting a couple times a year. You’ll also want to strip the door occasionally rather than just adding another layer of paint. Too much paint can change the thickness of the door, or fill in ornate details. If you’re unsure what type of maintenance your door requires, or you need a little door repair, give us a call. We’d be glad to help make sure your door lasts as long as it can!